Wednesday February 26th 1902 It is two years today since we bought this farm. I was very busy all morning. helped Will some about taking the paper of. Bob come and began work on the closet. We went down town in the afternoon. Will paid his interest. We got paint and paper and a lot of other things. We stopped at Woolfs. they have both been sick. Did evening work and read papers. Thursday February 27th 1902 I was busy doing baking all the forenoon. Bob came up and finished the closet. we were going to Woolfs but it set in to rain. Will painted the parlor wood work. Friday February 29th 1902 It was dark showery day. I had time to do some sewing today. Will painted another coat. Mollie got a chance to go to town to stay all night. 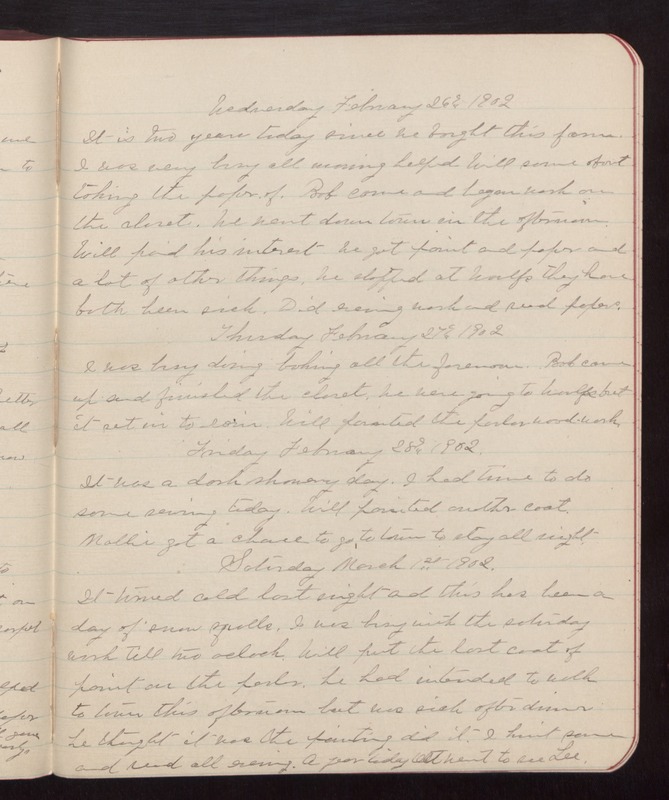 Saturday March 1st 1902 It turned cold last night and this has been a day of snow spells. I was busy with the saturday work till two oclock. Will put the last coat of paint on the parlor. He had intended to walk to town this afternoon but was sick after dinner. He thought it was the painting he did. I knit some and read all evening. A year today Ott went to see Lee.